When you see the blinking lights on the fire danger signs at four locations around the Island, you’ll know we’ve posted an alert bulletin. 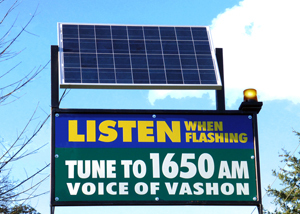 Then tune in 1650AM at home, on you car radio or VoV app. Watch for alerts on VoV’s Facebook page. With our free smart phone app, you can tune into KVSH 101.9FM and 1650 Alerts anywhere there’s cell service or wi-fi. Stay safe, informed and entertained even when the power goes out. Get the Free VoV App Now! NOTE: iPad users select the iPhone option for the app download. Learn more about the VoV Alert System. Chetzemoka BACK in Service on Point Defiance/Tahlequah route Here’s a message from Washington State Ferries: The M/V Chetzemoka, on the Point Defiance/Tahlequah route, has been returned to service. This message was posted on Wednesday at 01:00. Chetzemoka Out of Service on Point Defiance/Tahlequah route Here’s a message from Washington State Ferries: The M/V Chetzemoka, on the Point Defiance/Tahlequah route, is temporarily out of service due to unplanned vessel maintenance. Updates will be provided as conditions change. This message was posted on April 2nd, 2019 and will be updated as needed.